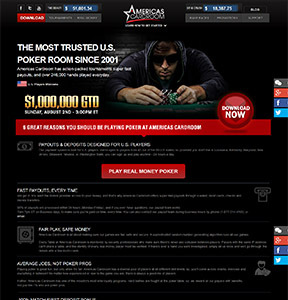 Americas Cardroom is now the #2 online poker site in the US in terms of traffic at the time that we conducted this review. But they could very well be on their way to the top spot by the time you read this thanks to their innovative promotions and commitment to delivering everything poker players demand. In 2015, Americas Cardroom introduced Million Dollar Sundays, a $1 million guaranteed poker tournament. This was a significant milestone considering it had been nearly four years since a $1 million guaranteed poker tournament was seen in the US. By laying $1 million on the table, Americas Cardroom has effectively attracted a number of new players to their community. The additional traffic means more people at the tables and ultimately bigger guarantees. But it’s not just great promos and big guarantees that have attracted players to the tables. Americas Cardroom has consistently scored top marks for payment processing, month after month after month, as rated by an independent payment processing report.